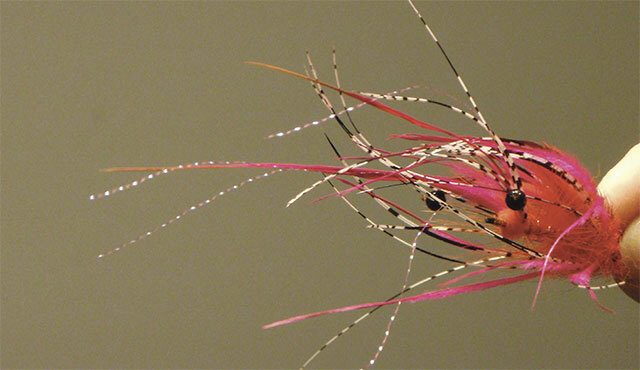 What Makes a Steelhead Fly? Most experienced steelheaders and guides, when pressed, will say that the specific fly we chose to swing is much less important than how—and how confidently—we swing it. Our best-known steelhead writers have echoed those sentiments, boiling fly choice down to a few basic points of profile and functionality. If a fly gives us the confidence to fish with intention and focus, it’s bound to be a winner, because the main goal, regardless of fly choice, is to spend as much time as possible “in the zone”—a trajectory that places our fly within striking distance of a steelhead. The more time we spend in there, the more positive feedback we get from fish and the more we learn to recognize the feeling. This progression leads to the experience of anticipating a grab before it happens, further reinforcing our set of beliefs. And since steelhead are capable of almost anything, almost any set of beliefs has the potential to produce at least the illusion of tactical success. But if the fly doesn’t matter as much as the presentation, why are there thousands of different fly patterns and styles, and only a handful of approaches to presentation? And why have so many steelheaders slaved over their vises trying to crack the code if there isn’t a code to crack? One reason is the creative enjoyment that fly tying offers. Tying also provides a time to meditate on our quarry and our fishing grounds. As Lani Waller says, we are hunters, flinting away at our arrowheads, reaching out and communing with the spirit of Steelhead. Tying our own flies makes us feel connected with the fish and the whole ecosystem on a deeper level. But there may actually be a few codes to crack—in fact, they may have already been cracked. After a thorough review of the flies and the literature, it’s clear there are certain flies that have proven to be exceptional. 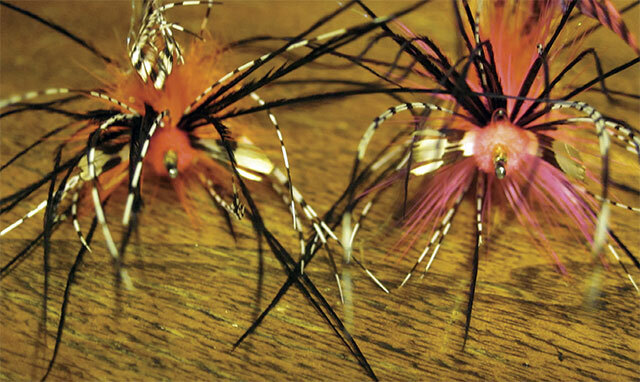 Often those flies happen to imitate something in the steelhead’s world. Something that steelhead are compelled to grab ahold of, if only for a quick nibble. The clearest examples are skated caddis patterns, dead-drifted egg patterns and nymphs, and swung “leeches” or sculpins of various sizes and colors. And let’s not forget the Desert Island fly, supremely effective for every species of salmonid: the egg-sucking leech. Its power is undeniable, though it probably better imitates an egg-sucking sculpin than a leech in most situations. So, with apologies to Mr. Shewey, who has more sense and experience in his pinky finger than we have in our whole bodies, we think the evidence goes against his opening quote. There are particular styles, colors, and patterns that are more effective than others. Maybe the reason we’re not all using them is the same reason we often refuse to believe facts that are staring us in the face: We’re naturally skeptical and stubborn. And we share a varying amount of uncertainty about steelhead behavior. That uncertainty is rekindled every time a steelhead ignores a skating October caddis as it turns to chase a drifting leaf or twig. But when we take the wide view, obvious themes emerge that can direct our fly tying into some very distinct and productive channels. Movement or undulation of a fly’s materials is a good thing. Contrast, detail, and prominent eyes seem to be triggers, at least in clear water. 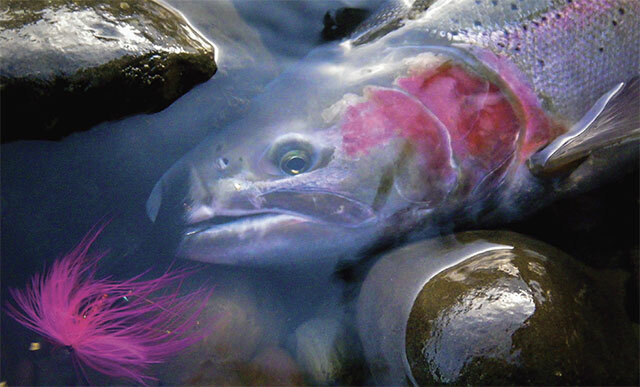 Sizing down to a smaller fly is most likely to trigger a strike from a shy or noncommittal steelhead. Color is the least important element, unless it is more important on any specific day. These rules of thumb are often countered or flatly broken by many steelheaders, and enough steelhead still respond so as to maintain confusion. 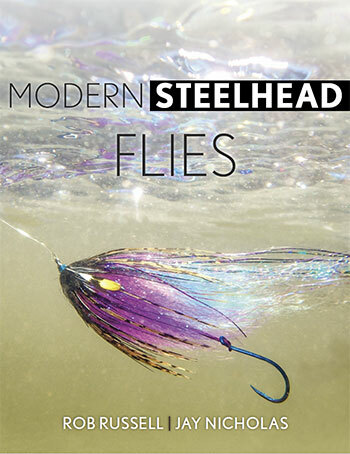 Excerpted with permission from Modern Steelhead Flies (Stackpole Books, September 2017); all rights reserved.